The Hay Inclined Plane is one of the famous features of this canal system. Because of the difficulty of obtaining water, and the steepness of the hills, this method of moving the boats between levels was preferred to locks. The boat is manoeuvred over a cradle, which is raised on a railway. At the top it passes over a sill and down the other side to be refloated. The weight is counterbalanced by a descending boat on the other end of the cable. The system is self-acting when a descending loaded boat pulls up an unloaded one, but in the reverse case a steam engine was used. (This quickly replaced a horse-driven winch, in use from 1791 - 1793.) Completed in 1793, it is the equivalent of twenty seven locks, and could be worked by four men, raising five or six tons in three and a half minutes. This would have taken 3 hours through a system of locks. 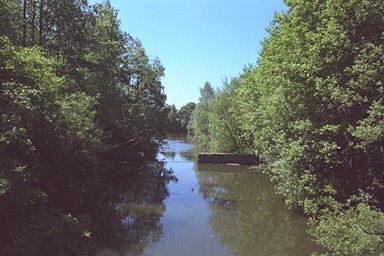 Below Middle Pool, Wombridge, and over the footpath round the pool, there is a length of water which is blocked at one end by Sommerfield Road. It runs parallel to the north-west side of the pool, then becomes dry and turns north towards Trench Pool and the Blue Pig, petering out into the industrial estate. It looks for all the world like a piece of canal, but it's not on any of the maps. Chris Williams explained that the Ocre Brook, which runs down as far as Wrockwardine Wod Way and is then culverted, used to have a wider section here which was popular for fishing. As yet, I've found nothing more here than an intriguing name for a street on a modern housing estate - there's nothing older than Telford here. But: just south of Old Wharf is Malinslee Junior School, and by the side of that runs a footpath, long, straight and steadily downhill, which connects with the canal at Hinkshay. Was there a plateway or narrow-guage railway to bring goods up from the canal to a "wharf" at Malinslee, an old township once much more significant than it is today? The Blue Pig pub at Trench was formerly The Shropshire Arms. Its patrons were largely the ironworkers from Wombridge. They produced pig iron, so called bacause the shape of the ingots resembled an upturned sow. The iron went a bluish colour as it cooled, and the workers got covered with blue dust, which they took with them to their "local". In time, the name of the house changed as a result. A student at Wrockwardine Wood School was told by a resident on the Cockshutt that there use to be pig-farms on the Cockshutt, and that the path known as the Pig Rails was a railway which took the pigs down to the canal to go to market. This is an excellent example of how an urban legend can grow from a distortion of the facts, for there were not farms but furnaces; not animals but ingots of pig-iron; and the Pig Rails is indeed the site of a railway linking the furnaces with the canal.